Every fall the gaming world convenes in Las Vegas for the Global Gaming Expo. On the exposition floor you will find suppliers for everything you might encounter under a casino roof, including table games. In that section of the business, you'll find everybody from the starry-eyed newcomers with a single game to the big corporations fully loaded with a whole portfolio of the latest twists to blackjack, poker, and baccarat. I've been going every year, in large part to check out the new games. To be honest with you, it is one of the few chances I get to chat with pretty women. Although it is supposed to be the gambling business, 2014 didn't see a lot of risk taking in the new table games arena. Mostly it was a lot of poaching of existing games already proven to be successful. The number of mom-n-pop businesses with their single game or two was way down from prior years. This year, SHFL Entertainment (commonly known as Shufflemaster) and Galaxy Gaming were the big fish in the pond of table games. Following, in alphabetical order, are the new tables games for 2014. 21 or Nothing is one of a couple games at the show by Play Live, featuring a custom-made 55-card deck, which includes the numbers 1 to 11 in five different colors. The company's philosophy is that we've all been brainwashed with the standard cards and a new deck is needed to bring new life to the casino floor. The way blackjack is played with these cards is to beat the dealer with either the best score up to 21 or the lowest down to zero. White cards are subtracted from the running total, so it is possible for the score to be negative. I can't say it was the easiest game to comprehend, but I certainly give the game makers points for creativity. Game by Full Color Games. Also see their game . 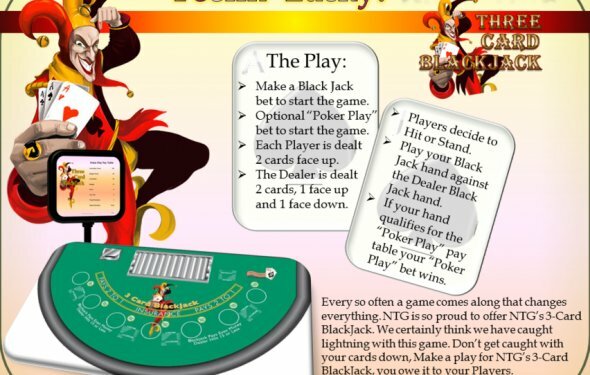 This blackjack side bet pays 7 to 1 if the player's first two cards and the dealer card are all the same color AND the player wins the blackjack bet. There is another version called 3 to 1 Blackjack, where only the player's cards are required to be the same color. Game by TCS John Huxley. Bust Bonus is a blackjack side bet. Unlike other side bets on whether the dealer will bust, with this one the player may choose to make the wager after seeing the dealer's up card. The pays vary according to what the up card is and whether or not all the cards in the dealer hand are suited. By Galaxy Gaming. Dueling for Dollars is a pretty much Casino War, except the player may bet on which side will win, as in baccarat. The Tie side bet pays a premium for a suited tie. An added feature is the Dual Bet, which pays based on the two-card poker value of the two cards. By Galaxy Gaming. Another game by the people at Full Color Games with the 55-card deck with five colors. This one is based on baccarat. Sorry, but that is as far as I can explain it at this time. Also see their game . 21 THE GAME. The new card game specially for 21st birthdays. The new card game especially for 21st Birthdays. 21 The Game is full of all kinds of appropriate 21st Birthday facts, quotes, trivia and more. 21 The Game is new and different. Ideal as a small 21st gift. A little extra entertainment for any 21st !